Off the back of what’s being dubbed Australia’s most ‘congestion-busting’ budget yet, the Australian Federal Government will be investing $15 billion into new road and rail projects in 2019, aiming to take tens of thousands of cars off the road and ease congestion in our capital cities. And not a moment too soon. According to new estimates, congestion is on track to cost Australia more than $50bn by 2031, and some of the country’s main arteries are slowing to a stagnant 1km/h at full capacity. But the conversation has historically been – dare I say it – ‘derailed’ by a focus on lifestyle choices, championing the voters’ need to get to and from work quicker without acknowledging the far-reaching impacts that standstill peak hours have on economic and societal health. At last stock take, Australia is falling far behind its 30-year productivity goals, and productivity is the economic engine room of any city, which impacts on both State and National GDP. Improving urban access and regional connectivity networks is therefore vital if we’re to free up our fast lanes and avoid congestion and social disconnection. As Australian metropoles continuously top the world’s fastest population growth rates, it’s refreshing to see the Federal budget acknowledging that the cost of doing nothing is more than the cost of doing something. And a welcome rail renaissance is at the heart of the budget’s solution. The standout item in this year’s budget is a $2 billion fast rail connection between Geelong and Melbourne. It will be the fastest train in Australia, with an average speed of 160km/h “the Fast(er) Geelong Rail”. Another $44 million has been allocated towards funding business cases for five more fast rail proposals in New South Wales, Victoria and Queensland. As the speed of connection between cities increases, our perception of distance changes and fundamentally the feeling of connection from one centre to another improves. With train rides from the CBD to regional centres as far as Geelong or Bendigo soon to drop below the hour mark, the concept of city ‘outskirts’ won’t feel so far away, inviting growth in our regional centres. In Victoria, we’re already seeing this in action as thinking around new airport rail line begins to progress, Sunshine will be the new Southern Cross – an equidistant mid-point between Geelong and Melbourne that will activate the entire western corridor. There has been talk that the Federal budget neglected investment in a high-demand Melbourne-Sydney fast rail, but infrastructure of this scale requires a multi-term investment, and there’s no way to fund it in one go. Rumoured connections like the Melbourne to Shepparton fast link will start paving the way, building out from where there’s critical mass, to connect regional centres in stages – like the Sydney to Newcastle and Brisbane to Gold Coast links – and over time we can join them up in long-term interstitial linking projects. Historically, Australia’s urban connections have often tended to radiate out from rather than orbit the CBD, with arteries stemming out in a linear fashion to the suburbs; in Melbourne’s case creating a so-called sleeping donut of inactivity around the city. So, it’s exciting to see investment in orbital projects that link suburban locations without intersecting the CBD and engage the outskirts and activate previously inaccessible corridors. The confluence of orbital ring roads connecting primary arterials is significant in terms of the growth of big cities around the world, with geographers long analysing the activation of outskirts with East-West orbital links and interstate ring roads like those central to the United States’ national connectivity. The revival of regional rail is about more than just connecting communities. Regional centres can become catalysts for revitalisation, the connection can be an enabler for investment and growth in these burgeoning centres – as well as a drawcard for migrants and residents increasingly settling outside the CBD. Residents want to have choice in terms of lifestyle and recreation. For example, connecting Shepparton to three other regional centres will completely change the radius of housing affordability, providing a far better outcome for families and amenity. This potential lifestyle shift has huge positive impacts in terms of economic activity and positive community benefit. While there is an upfront regional investment needed, money spent to activate and connect these centres reaps return in further waves of investment. But it’s critical that we consider the connection to community and celebration of place and location within any new rail project. In quadrupling the Urban Congestion Fund to $4 billion, a large chunk of the budget will be used to improve parking and modal connection around train stations. When thinking of how to best address this need for seamless connecting transport, wayfinding and engagement, I am reminded of Japan’s central stations, renowned for their unparalleled integration and a greater diversity of functions in and around these spaces, creating new hubs of activity and positive behavioural trends beyond the function of boarding and switching trains. If we are simply creating places to travel through, we’re missing myriads opportunities for a complex and diverse user experience with benefits for community and economic activation. Therefore, bringing diverse voices into the core of the conversation – i.e. urban design teams – helps turn stations into central hubs that sit at the beating heart of any local context or community, and caters to diverse and changing populations for years to come – without becoming redundant as the surrounding city evolves. The greatest skill on any rail infrastructure team is a collaborative mindset that welcomes and combines engineering, architecture and other disciplines together in a way that’s more powerful than the sum of its parts. These disciplines cannot work holistically without a team spirit of collegiality and shared focus on the end user experience. In fact, our core role as architects and engineers must be to create a seamless user experience for travellers – one that is as joyous and functional as possible. The public doesn’t care where the engineering stops and the architecture begins, but they care about the ease of their end to end journey. If we’re truly going to ease congestion and revitalise Australia’s rail networks, experienced teams with collaborative expertise need to sit at the core of any rollout from the budget’s $15 billion. 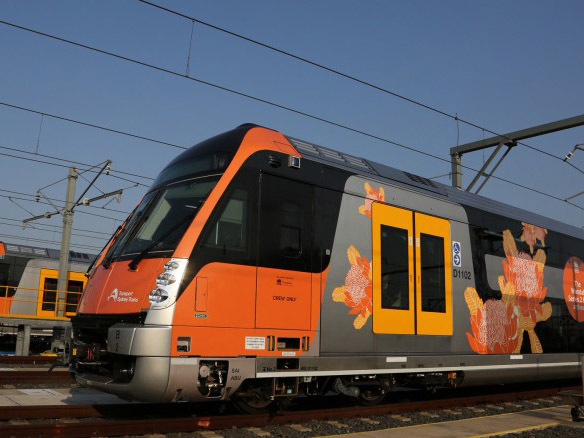 Architectus is currently commissioned to work on a number of significant Victorian rail projects, working collaboratively with the Victorian Government towards positive outcomes include the Melbourne Airport Rail link, Melbourne Metro tunnels and the Sydney Metro as part of the Metro consortium.